The maintenance group have conducted Fault Clearance Inspection on 50MVA Transformer, 115kV Line 1 and 115kV Line 2 Line HV Equipment last October 5, 2010. 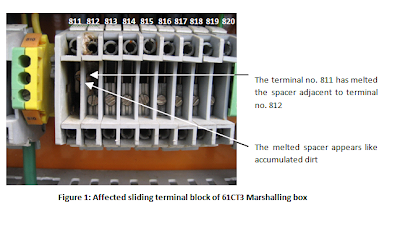 One finding in their FCS report is on current transformer which they noted that the spare CT core terminal block has signs of melting. Since the terminal block is not used and the shortings are still good enough, they did not include their findings in their work summary under technical service report. 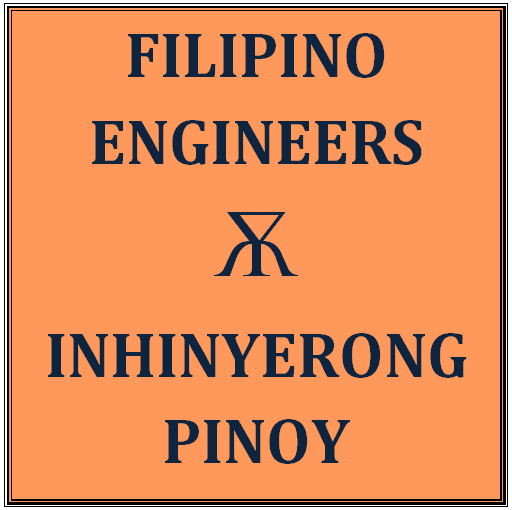 On October 12, 2010, the results of their FCS were verified by the Engineer-on-duty. The affected terminal block has slide contacts which can be moved to isolate the upper and lower points (please see figure 1). As SS Engineer has observed, the slide of the affected terminal has been moved so that the CT upper termination has been cut off from the other end. Basing on the existing CT diagram, the spare CT core has one isolated/open phase (please see figure 2). The affected terminal must be shorted to its adjacent terminal so that the spare CT circuit will be complete as per diagram. However, the affected terminal has already melted its adjacent side so the two terminals have been joined or electrically connected already. 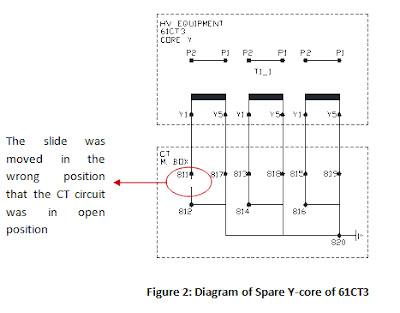 Therefore, the open phase of the CT core due to the wrong position of the slide of the affected terminal point is in fact been shorted to the correct terminal because by melting the spacer between the two adjacent points, the two slides are connected back together. The situation has been informed to the Head of Substation for District 1. Since the two points are already connected to each other, then he advised that emergency shutdown can be done tomorrow with the presence of Maintenance group. On October 13, 2010, emergency shutdown of 115kV Power Circuit Breaker had been coordinated to Area Control Center. When the another Maintenance Group arrived at the substation, Power Circuit Breaker was SCADA tripped to facilitate correction of the melted terminal block. After its Disconnect Switches had been opened, the group immediately started their activity. They noticed that the melted terminal block is not warm which means that the melting of the terminal block did not occur recently. As per the team leader, during the testing of Line 1 protection, only the utilized CT cores were tested and operated. Then they replaced the burnt terminal points and checked the CT boxes and did not find anything abnormal. After thorough inspection, they give their clearance to energize back the 115kV Power Circuit Breaker. At 1201H, 115kV Power Circuit Breaker was returned back to energized condition. 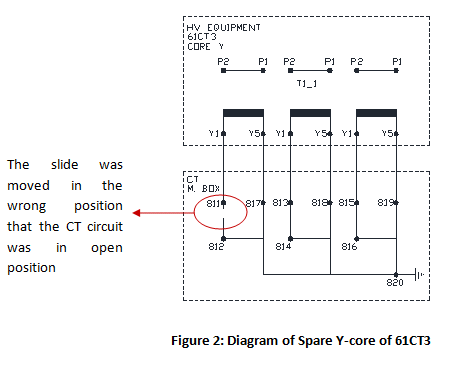 The root cause of the problem is that the slide of one terminal of the spare CT core was not returned to its correct position. In the CT marshalling box, each group of terminal block represents the CT cores available. The arrangement of the termination on terminal block is two termination points for each phases A, B, C, then the neutral point is located at the end of the terminal block. Then, the second point from each phase is connected to neutral. But since this is a spare CT core, both points from each phase must be shorted to each other, then connected back to neutral point. So, terminal block no. 811 and 812 are the points that come from phase A. They are shorted at the lower bottom of the terminal point. But since the slide of terminal block no. 811 is in open position, high voltage developed across the secondary therefore and it drives the core into saturation which generates a lot of heat. Normally, if there are enough heat generated, the oil expands past normal levels, and a pressure relief device operates, causing the CT to explode. In this case, the spare CT core generated heat that was transferred to the wire which is terminated on terminal block no. 811. Then connected wire then melted the adjacent spacer. However, when the spacer melted, the two slides came contact with each other, therefore the Phase A of the CT core was shorted back. Even so, the period when the slide has been moved cannot be established. 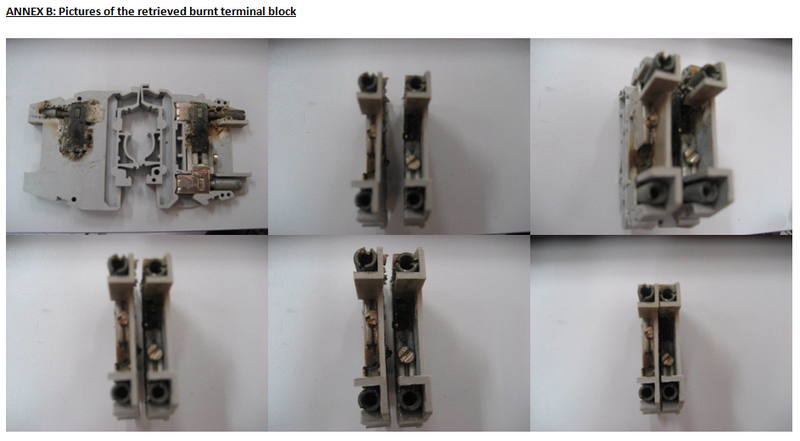 The previous test reports submitted by Maintenance group did not reflect the burnt CT terminal block. The melted spacer did not appear to be obvious enough unless thorough inspection is done. It can be mistaken as dirt accumulated for the time being. The Substation group could only vacuum the terminal blocks and spray them with contact cleaner. The results of thermal scanning is also not conclusive as when the slide was left in wrong position because no hotspot was found no CT marshalling boxes as per data of IR Scanning of Substation. This can also be attributed to the fact that the affected phase of the spare CT core has been shorted already during the conduct of scanning, thus the generated heat has dissipated already. A. Conduct of comprehensive inspection the CT boxes including its termination and terminal blocks. Check the terminations carefully. 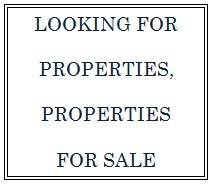 Inspect thoroughly the terminal blocks for any signs of melting, accumulated dirt and burns. If these abnormalities are present, coordinate to District for the necessary corrections to be made. B. Conduct IRTS Scanning on all marshalling boxes especially termination points, terminal blocks and other devices inside marshalling boxes, kiosks and cabinets. C. Inspect the HV equipment before and after conduct of maintenance by Maintenance Group.